Kids will love playing on the grandiose replica pirate ship with a water slide. Choose between air hockey, billiards, and arcade games. The Lake Buena Vista Factory Stores are literally right next door. Grab dinner at Frankie Farrell's, a family-friendly pub on-site at the rental resort. Enjoy free shuttle service to Epcot®, Universal Studios® and SeaWorld®. Your kids will love the waterslide at Pirates Plunge Pool. Grab a tropical cocktail at the Hawaiian-themed Lani's Luau. Relax with a good book and a glass of wine in the jetted tub - there's one in every condo. 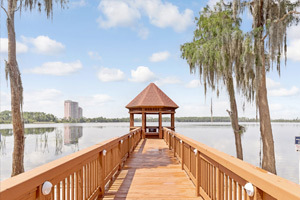 Lake Buena Vista Resort Village & Spa a staySky Hotel/Resort is conveniently located in the heart of Orlando, near the area’s best theme parks and next door to shopping at Lake Buena Vista Factory Stores. Don’t bother unpacking once you get to your condo, just get changed into swimsuits and get ready to hit both of the outdoor pools. There’s a zero-entry pirate ship pool that the kids will love and a relaxation pool that grown-ups will love. Go for a swim or unwind with a cocktail from the poolside tiki bar in a lounger or hammock. When it's time for lunch, there’s an Irish Pub and a Pizza Hut on-site. Treat yourself for your vacation planning skills with a massage, facial or manicure at Reflections, the full-service spa and salon while the little ones hang out in the game room or enjoy the scheduled activities at the Kid’s Club. One- to three-bedroom condos sleep four to eight guests and have plenty of room for the kids and all of their blankets, toys and even a few imaginary friends. Stop by the on-site convenience store or the nearby Walmart Supercenter – your fully equipped kitchen won’t stock itself. Recruit the kids to help bake your famous double chocolate brownies (not that they’ll need convincing). Your in-suite washer/dryer will make post-chocolate cleanup a breeze. Catch a sitcom rerun on the Flatscreen TV with cable. Fireworks view residences are available if you want to watch from the comfort of your condo. There’s nothing better at the end of the night than a relaxing soak in the jetted tub. Wine optional – but recommended. Lake Buena Vista Resort Orlando is just next door to the Lake Buena Vista Factory Stores. Bargain hunters will appreciate the deals on Reebok, Timberland, Levi’s, Calvin Klein and more. One of the best things about Orlando is the theme parks. The resort provides a scheduled shuttle to the major theme parks including SeaWorld®, Walt Disney World® (drop off location is at Epcot®) and Universal Orlando®. Visit the Concierge Desk 24-hours in advance to secure your seat on the shuttle. SeaWorld® has shows, animal experiences and rides. Check out Sea Lions Tonite, featuring Clyde and Seamore. Get up, close and personal with a dolphin and see five species of penguins. Antarctica: Empire of the Penguin allows you to experience the South Pole as a penguin would. It’s a motion-based simulator ride and offers two versions: one for thrill-seekers and one that is calmer. Epcot® is home to the eleven countries in The World Showcase®. Ride through Arendelle with Anna, Elsa and Olaf in Frozen Ever After®. Soar around the world in Soarin’®. Hollywood Studios® has the Twilight Zone Tower of Terror®, Toy Story Mania® and Fantasmic®! Pandora – The World of Avatar® is the newest attraction at Animal Kingdom®. Beloved attractions Dumbo the Flying Elephant®, Pirates of the Caribbean® and It’s a Small World® can be found at Magic Kingdom®. Harry Potter fans will love The Wizarding World of Harry Potter®, located over both Universal Orlando® parks. Board the Hogwarts Express, escape from Gringotts, go on a Forbidden Journey and dine at Three Broomsticks. Universal Studios® is home to Transformers: The Ride 3D®, Despicable Me: Minion Mayhem® and E.T. Adventure®. Jurassic Park River Adventure®, Skull Island: Reign of Kong® and The Amazing Adventures of Spider-Man® can be found at Universal’s Islands of Adventure®. Reservations are required for massage services and spa treatments. Reservations can be made by contacting the condominium resort prior to arrival, using the contact information on the booking confirmation. Children 18 years old and younger stay free when occupying the parent or guardian's room, using existing bedding.